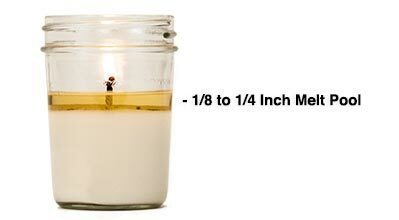 A full melt pool means the wax has been heated long enough to reach the edge of the container. This usually occurs in about 1-2 hours. A full melt pool should be 1/8 to 1/4 inch deep which will allow the fragrance to disperse more completely into the room. What is Tunneling and How do I Fix It? What is the correct pour temperature for my wax? How do I weigh fragrance oil? Can I use crayons to color my candles?